Apple launched the iMac G4 in early 2002 as a replacement to the hugely successful original iMac range. Not only did Apple give the new iMac the more powerful PowerPC G4 chip, cure which had up until then only been used in its pro range of PowerBooks & PowerMacs, it also introduced a radical new design which was announced to the world on the cover of Time magazine. The iMac G4’s design comprises of a dome base which houses the circular motherboard and the rest of the computers internals, and an LCD screen which is pivoted onto the base by a steel & chrome neck. This unusual design allows the screen to be moved into whatever position is most comfortable for the user and helped to earn it the nickname iLamp. The first iMac G4 was available with a 700 Mhz Processor, 15” screen and the choice of either a CD RW or a more expensive DVD ROM/CD RW drive. The DVD ROM/CD RW model also came with a pair of external Apple Pro Speakers, as unlike the original iMac range, the new iMac didn’t have internal speakers. During it’s production of 2 years the iMac G4 went under a number of small but significant revisions including faster processors, the introduction of USB 2.0 ports and bigger screens. 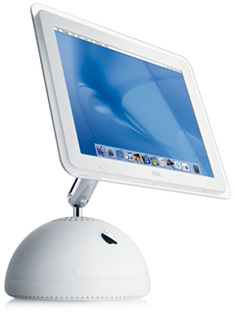 The final (and best) iMac G4 featured an impressive 20” screen, 1.25 GHz processor, DVD-R/CD-RW (SuperDrive), 64 MB NVIDIA GeForce FX 5200 Ultra graphics processor, 1GB of RAM and an 80 GB hard drive. If the iMac G4 range had one flaw it was the price, unlike the CRTS used in the original iMac range the iMac G4’s LCD screens were significantly more expensive to produce. As a result many users ended up purchasing eMacs which still had CRT screens but also featured the same G4 PowerPC chip. These days the iMac G4 is considered a design classic and I would argue that in some respects it looks better than the more industrial looking designs that Apple seems to be moving more towards in 2008.